To access the codes of all economic concepts available in the IMF data site, click on IMF Data – Indicator Mapping Report. It contains the list of concepts with their corresponding former Publications codes (codes formerly used in the printed and CD publications) and the codes in the IMF Data platform. As of August 25, 2017, following a major streamlining and standardization exercise, a number of series were removed or added. To find the list, click here. The IMF new Data Indicator Code conforms to a standard as prescribed by the SDMX (Statistical Data and Metadata Exchange) system. 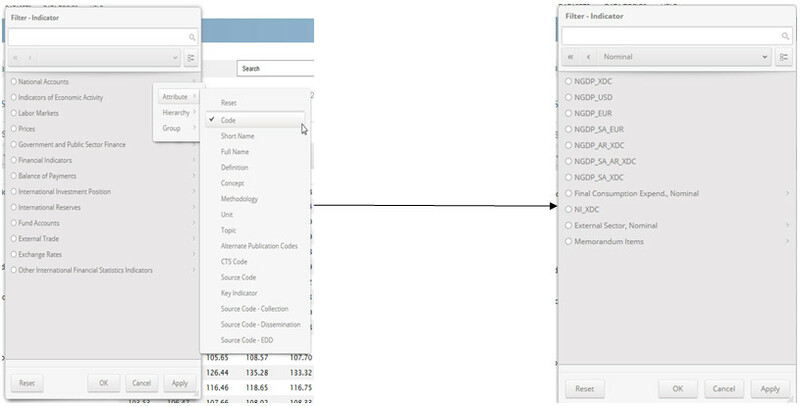 To select concepts using the Code attribute, you can use information from the Indicator Code (column B within the Report). Then left click (select) Code. See below screenshots for details. NOTE: The code attribute will only be displayed for concepts which have data. Query: How to use it?